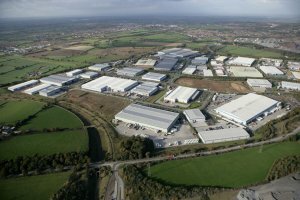 Interlink Park is a premier industrial warehouse development in North West Leicestershire. Approximately 1.5 miles from Junction 22 of the M1 motorway, in the distribution "Golden Triangle" bounded by the M1, M6 and M42 motorways, the location brings areas from Southampton to Hull and Norwich to Cardiff within the EU permitted uninterrupted HGV drive times. The development enjoys easy access to the commercial centres of Leicester and Loughborough allowing access to Intercity rail links, which are also available from Derby and Nottingham. Both East Midlands International and Birmingham International Airports are within easy reach. Occupiers who have chosen Interlink include Laura Ashley, Brantano, Hayes, Antalis, Nissan, Benson Box and Bunzl Healthcare.